UST Power System Model 1110c. Was working a couple weeks ago and built up pressure to 100psi. Today, it would only go to 40psi. I disassembled the cylinder head and cleaned the flapper valves and checked they were seating correctly. Slight increase in pressure to 50psi, but no more. My suspicions are now leading to the piston rings. If I can find parts for this, the rings would be the next thing I would do. But trying to find any online support eludes me at this point. 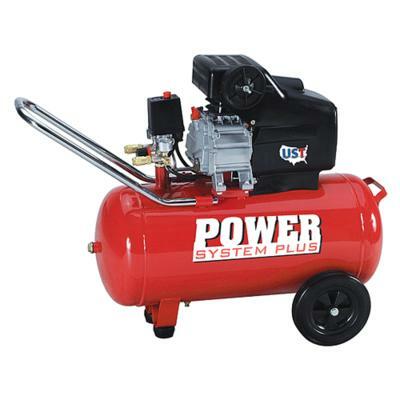 Brian, I have uploaded a photo of a UST Power System compressor, though I cannot find an image of your specific model. If yours is similar to this, then it has an oil fill tube and a vent. If your piston seals are leaking sufficiently that your compressor will not build pressure past 40 PSI, then you should be able to feel quite a flow of air out of the oil fill tube, as that cap is vented. I rather more suspect that you have a gasket that lets go at 40 PSI. That you disassembled and reassembled the pump made a change. Maybe you torqued the bolts down tighter, but you managed to hold off the leaking of the gasket, if that is what it is, for another 10 PSI. Try a high heat gasket sealer and see if that makes a difference, or make a new gasket from high heat gasketing material. Also, empty the tank, remove, clean and replace the tank check valve. Late last night I pulled the entire head to check the cylinder surface and rings. I did a minor honing and polish of the cylinder wall. The rings appeared basically still new, as this unit has maybe a total of 3 or 4 hours run time. Got it back in 2011. Double checked the flappers, they were still clean from before and appeared to be seating well. While there I also polished both sides of the flapper plate. Just a note that the tank is holding pressure, which leaves out the check valve. Though it does take a long time to just build 50psi at this point, about 5 minutes. Where before it would take 2 or three minutes to build to 100psi. After reading the section “Compressor Won’t build Pressure”, that gave me a couple ideas in conjuction with your comments. “Quick Check” Yes, there is some air coming out of the intake opening. I will try your idea of sealing the gaskets tonight to see if that causes any changes. Also, there is air flow coming out of the oil fill tube. Come to think of it, you can hear it and it seems to be more than I can remember. You are welcome, Brian. Air out of the intake – that’s an intake valve problem. Lots of air out of the oil fill cap vent, that’s a piston ring or seal problem. The main problem I found was, as it turns out, was the gasket on the bottom of the flapper plate. While it was running, before it warmed up, I used the old soapy water method. Sure enough it appeared air was coming from the gasket. Replaced both upper and lower plate gaskets, in addition of the honing of the piston cylinder and polishing the plate, it now fully gets up to full pressure in about 2 minutes. Faster than it did before. Only issue now is the check valve has a crack. I think the check valve from a Powermate compressor may be the fit. Brian, so very glad I was able to help with your compressor problem. I think it another good rule of thumb is if you disassemble the pump to get at the valves, then you want to replace the gaskets with new ones when you reassemble to ensure that they aren’t part of the original problem.